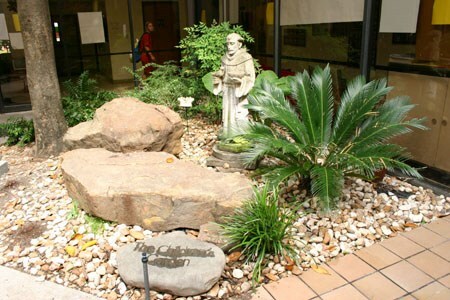 St. Francis School was founded in 1985 by a small group of parents and teachers. At that time the school had 50 students and operated in borrowed Sunday School rooms. Classrooms had to be completely dismantled every Friday and put back up on Monday morning. From 1987 to 1995, the school rented a building, but by the time enrollment reached 144 students, space was inadequate. With no room for growth, it was impossible to achieve any economies of scale. There were no funds to pay teachers an appropriate salary, make repairs to the school building, or replace aging equipment. At that time, the school ended at fifth grade, and there was no space for a middle school. In the spring of 1995, we were informed that our lease would not be renewed. With generous financial support from parents and friends and backing from a local bank who supported our mission, St. Francis purchased a burned out shell of an office building and renovated it to meet the school’s needs in time to open school in August. After our most recent renovation over the summer of 2011, the Laycock Classroom Building is well-equipped to serve all students in 32 classrooms, computer lab, office space, art room, library, kitchen, and cafeteria. St. Francis also has a dedicated space for The Learning Center, private and small-group tutoring resources for students interested in additional academic attention. The elementary playground is at one end of the building. In addition, the school owns a 3.4-acre tract across the street from the school that includes a full-size lighted soccer field and track. Through the generosity of many St. Francis family members and friends, the school is proud of the Melanie and Ben Barnes Gymnasium, which also houses the music room, locker rooms, and coaches’ offices.